If your busy life life doesn’t allow you much time for washing clothes or you have the tendency to spill liquids on your white t-shirts on a regular basis, you might be interested in this new t-shirt called the Silic t-shirt. 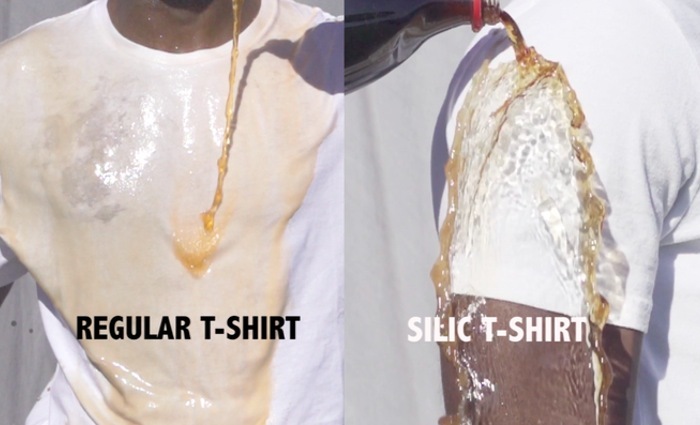 The Silic t-shirt has been designed combining silica and hydrophobic nanotechnology to create a t-shirt that is made of an ultra soft fabric made to endure sports, exercise, and liquids. Watch the video after the jump to learn more about the Silic t-shirt project and see it in action. “Unlike other hydrophobic technologies that wash away after one cycle, our shirts are fully machine and hand washable. They will retain their properties up to 80 wash cycles. To reactivate water repellency, tumble dry, normal, low heat at least every three washes. Our prototypes have been tested to meet our requirements and the finished fabric is ready to be cut and sewn. We need to meet all the minimums to order this fabric and that is where your pledges help. The Silic t-shirt project is currently over on the Kickstarter website looking to raise enough pledges to make the jump from concept to production. So if you think Silic t-shirt is something you could benefit from, visit the Kickstarter website now to make a pledge and help Silic t-shirt become a reality.